[211 Pages Report] The military CNS technologies market report covers the forecast of the military communication, navigation, and surveillance technologies and its dynamics over the next six years, in addition to recognizing market application gaps, recent developments in the market, and high potential regions. The military CNS technologies market has been analyzed primarily on the basis of varied CNS technologies used by defense forces worldwide during the forecast period, considering 2015 as the base year. Market size estimations for various segments and subsegments of this market were obtained through extensive secondary research and government sources, such as the U.S. Department of Defense, the U.S. Air Force, company website, corporate filings such as annual reports, investor presentations, and financial statements, and trade, business, and professional associations, among others. Furthermore, corroboration with primaries and market triangulation with the help of statistical techniques using econometric tools were carried out. All percentage shares, splits, and breakdowns were determined using secondary sources and verified through primary sources. All possible parameters that affect the market covered in this research study have been accounted for, viewed in extensive detail, verified through primary research, and analyzed to acquire the final quantitative and qualitative data. This data is consolidated and added with detailed inputs and analysis from MarketsandMarkets, and presented in this report. 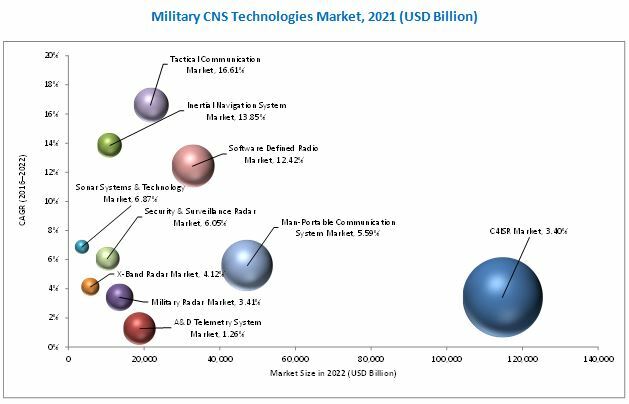 The ecosystem of the military CNS technologies market comprises manufacturers, distributors, and end users. Key manufacturers of military CNS technologies are Lockheed Martin (U.S.), Raytheon Company (U.S.), Northrop Grumman Corporation (U.S.), Saab Group (Sweden), Thales Group (France), BAE Systems plc (U.K.), Elbit Systems Ltd. (Israel), L3 Technologies (U.S.), General Dynamics Corporation (U.S.), and Honeywell International Inc. (U.S.), among others. Communication, navigation, and surveillance (CNS) technologies are widely utilized in military CNS equipment for battlefield operations. There have been huge R&D investments made in this field by prominent players operating in the defense sector, owing to the replacement of legacy systems in developed countries, technological innovations in defense communication equipment, and modernization of battlefield operations. A Software Defined Radio (SDR) is a radio communication system that attempts to place most of the complex signal handling involved in receivers and transmitters into the digital (DSP) style. These radios are increasingly used by defense forces to communicate through various frequencies, as well as to implement different protocols. In addition, the propagation of military CNS technologies from conventional tools to advanced products will help enhance the combat capabilities of defense forces. One of most immediate benefits that software defined radio can provide is spectrum flexibility. As the defense spectrum is off-limits for civilian use, the efficient use of spectrum is expected to be the key focus area in the near future, which will eventually push the growth for military CNS technologies market. The demand for advanced communication systems to replace legacy equipment, the need for compatibility of devices with future standards, and the need to reduce the cost of end products and services are some of the major factors driving the growth of the SDR segment. However, high development costs and integration issues are factors restraining the demand for SDR. Navigation systems have evolved since their inception in World War II. Earlier, most navigation systems were stable platform systems, wherein navigation sensors were mounted on a platform, independent of the rotation of the object. Presently, most navigation systems are strapdown systems. Over the course of time, navigation systems have evolved in terms of the technology used. The use of advanced technologies replaced mechanical components with electronic components, thereby increasing the accuracy and reducing the overall weight of navigation systems. An Inertial Navigation System (INS) is a type of navigation system that tracks the position and orientation of an object relative to a known starting point, orientation, or velocity. The increasing demand for new aircraft delivery will directly impact the growth of the inertial navigation system segment, as INS is one of the primary systems installed in every aircraft, eventually the integral part of military CNS technologies market. INS is primarily used for stabilization, guidance, and control in a variety of application platforms, including airplanes, unmanned aerial vehicles, missiles, drones, ships & submarines, and military vehicles. 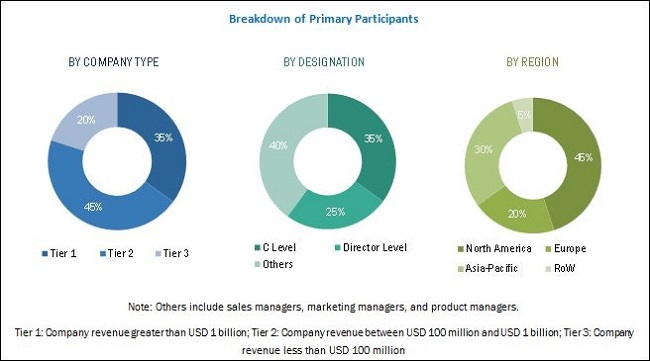 Growth in the commercial aerospace industry, increase in air passenger traffic, advancements in MEMS technology, increase in offshore oil & gas exploration activities, and rise in demand for unmanned underwater vehicles are factors anticipated to drive the demand for inertial navigation systems, subsequently the military CNS technologies market. Military radar, a type of surveillance system, is utilized for air & ballistic missile defense, air-to-air combat, and strategic long-range surveillance, among other military applications. It plays a very important role in the military CNS technologies market The increase in demand for military radar systems and technologies is spurred by the need felt by several nations to upgrade their radar technologies, so as to safeguard their borders from terrorist threats. Military radar also offers countries with insurgent situations the access to perform surveillance and weapons control as well as other monitoring functions. Increased demand for defense surveillance over porous and attack prone borders, increased spending on defense equipment by emerging countries, and increased terrorism and ongoing inter-country conflicts are factors contributing to the rising demand for military radar. Unlike earlier times, defense surveillance has become an integral task for defense forces worldwide, considering the aforementioned causes. Key players operating in the military CNS technologies market are Lockheed Martin (U.S.), Raytheon Company (U.S.), Northrop Grumman Corporation (U.S.), Saab Group (Sweden), Thales Group (France), BAE Systems plc (U.K.), Elbit Systems Ltd. (Israel), L3 Technologies (U.S.), General Dynamics Corporation (U.S.), and Honeywell International Inc. (U.S.). Contracts and acquisitions are major growth strategies adopted by top players to strengthen their position in the military CNS technologies market. 16.9 L-3 Communications Holdings, Inc.